We all know how important it is to start reading to little ones as soon as possible, so why not start to grow their love of reading right from the start—at their baby shower! Use our free printable book request card to ask guests to bring a book instead of a card to get baby’s library growing from the very beginning. This gender-neutral free printable Book Request Card is perfect to get baby’s book collection started off right! The cute poem asks baby shower guests to please bring a book instead of a card and even notes that the book can be old or new, so guests don’t feel they’re being asked to spend more. Simply print the Book Request Card file onto a white card stock, and trim the cards down with a paper cutter or scissors. 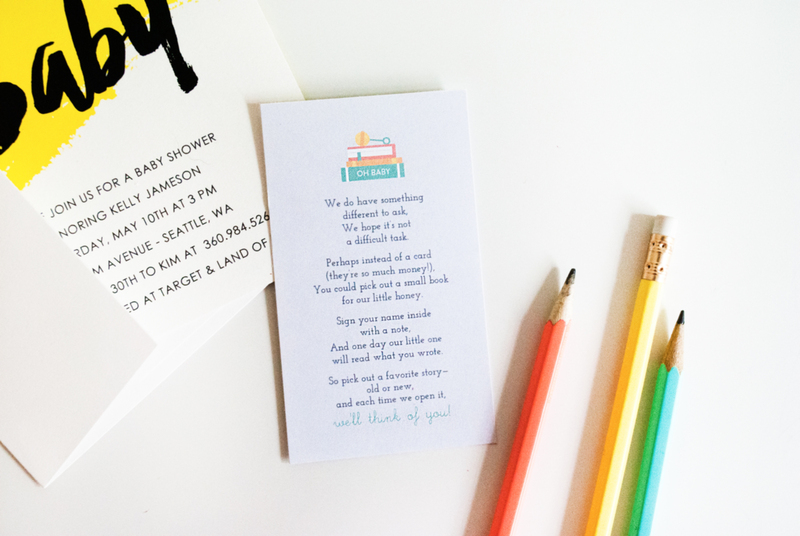 Slip the cards in with your baby shower invitations, and wait and see what books guests choose! Guests at the baby showers I’ve hosted have loved the idea and enjoyed choosing a book for baby rather than getting a card that may just be thrown away. My kids love reading notes in books to see who they’re from, and the books become sweet keepsakes for them as they grow up. Mom-to-be is sure to love all the books she receives!